Are you a gift procrastinator? Yikes, I am! I've been very busy, friends. I haven't had any time to post, let alone make Christmas gifts! If you are like me, don't worry. 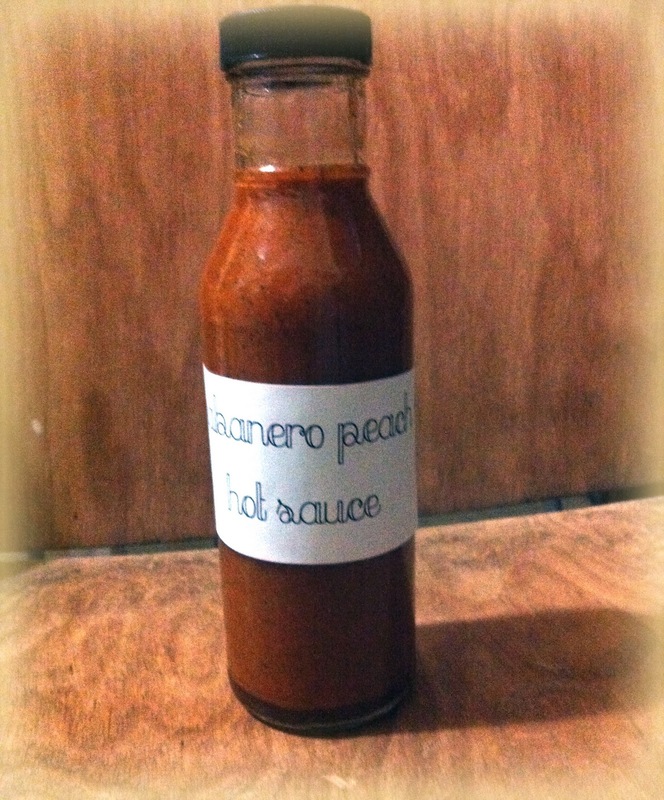 We have plenty if time to make awesome gifts - like this Habanero Peach hot sauce! habanero hot sauce will heat you up this winter! habaneros, canned peaches, vinegar, and salt. From here, you can add spices to make it more interesting. I added ginger, paprika, cumin and a little bit of ground cloves. I feel like it made a really bright vinegar hot sauce into a more complex sauce. I think it's delicious (especially on wraps, like below) but it would have been good with just the plain ingredients too. This is the procrastinator's guide to gifts, anyway, so let's not make it too complicated! habanero peach hot sauce on a salami & green salad wrap! 5 jars of hot sauce!!!! Yikes. I've adjusted the recipe for just one large jar. PLEASE make sure you use gloves when you are seeding the habaneros. I didn't and I regret it to the max!!!! My fingers burned for almost a whole day. I could barely sleep last night because my fingers were burning so bad. So please use latex gloves. Blend the peppers, peaches, sugars and vinegar in a food processor or blender.... or in my case a Magic Bullet. Measure in the spices and blend until liquefied. Pour into clean jars, and refrigerate overnight before using. Your jars do not have to be sterilized because there is so much acid in this recipe, not to mention peppers, that it will likely never, ever go bad. blend in batches in your own magic bullet. no, it's not that kind of magic bullet. Add labels if you want to be fancy like me. I think these labels really classed up my homemade hot sauce gift! save your vinegar jars and use them to put your hot sauce in! We are well on our way to getting Christmas gifts, or holiday gifts, for everyone!!! More to come!